We are a Nursery class of 3 and 4 year olds, taught by Miss Dyer, Hayley Preston, Gemma Owen and Mrs Groom. We would like to welcome all our new children and their families to Haughmond class. We are looking forward to working with you. If you wish to apply for a place at nursery please complete the form here and return it to our main reception area. Alternatively, call 01743282360 to ask for further details or to arrange a visit. This term the whole school theme is ‘Location, Location, Location’, in Early Years we will be learning about different places in and around Shrewsbury. In Nursery our focus will be ‘Where could I go today? We will visit a local library, a farm and a woodland area. We will also learn about seasonal changes and different cultural celebrations that take place during the Summer term. We provide lots of opportunities for role play in nursery, with a Home Corner in the classroom and a number of role play boxes, e.g. doctors, hairdressers, vets, shopping. 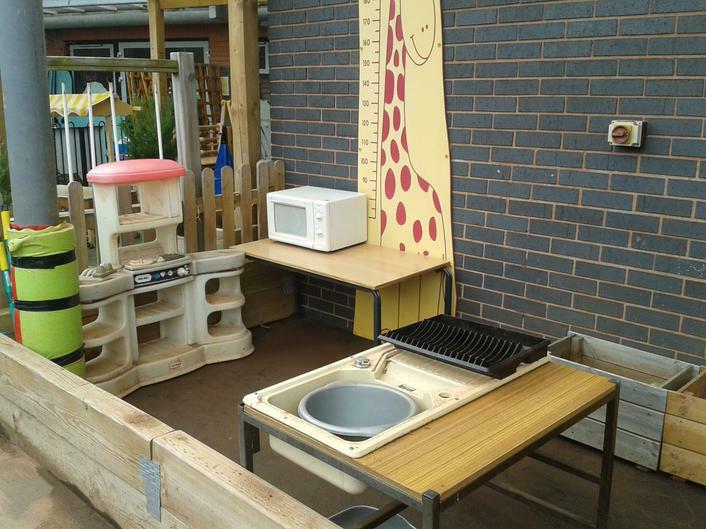 Outside we have a den/construction resources, a mud kitchen and a pirate ship. In Literacy activities we will be supporting the children to learn to recognise and write their own name. We will be encouraging children to take part in mark-making activities both inside and outside the classroom, asking them to talk about the marks they make. This term we will be sharing a range of fiction and non-fiction books linked to our topic. We will read non-fiction books about mini-beasts and summer, to link with our Forest School sessions. We will have a daily letters and sounds session where we will focus on listening to sounds, singing rhymes, clapping syllables in our names and other words, making sounds with our voices and with instruments. We will be reading stories linked to our theme. Visit the library to borrow some of the books we will read in Nursery. Can you find any books about mini-beasts, farm animals and summer? Over the school year we aim for children to become very familiar with between 6 - 10 stories We will read them frequently and encourage the children to join in. We would like to celebrate your child’s achievements at home and for you to share your proud moments with us. Please collect a yellow star and write on it what your child has achieved, and the date. We welcome photographs or certificates to display in the cloakroom area, alongside the achievement stars. School closes for the summer holidays on Friday 19th July and re-opens for the autumn term on Tuesday 3rd September 2019. Numberblocks Sing along and learn all about numbers with the Numberblocks! Something Special Nursery Rhymes Sing along to your favourite nursery rhymes with Mr Tumble. Down on the Farm Explore the outdoor world of farming and the countryside with JB and Storm from Down on the Farm. Alphablocks Watch as the letters of the alphabet tell stories and make words using phonics. Play the learning game, watch clips and print colouring pages. CBeebies Bedtime Stories Join a host of different celebrities for a different story read each night just before bedtime.